Lang Pioneer VillageRecord Owner? Log in. From Peterborough: 10 km south on Hwy 7 then 6 km east on County Road 34. Turn left on Lang Road. From Keene: West on County Road 34 to Lang Road. Lang Pioneer Village Museum was established by the County of Peterborough in 1967 to celebrate and preserve the history of the area. Nestled along the banks of the historic Indian River, Lang Pioneer Village Museum features 30 restored and furnished buildings. Discover the history, language and culture of the Micchi Saagiig (Mississaguas) at Aabnaabin Camp. Villagers of all ages, dressed in authentic historical costume demonstrate the trades, chores and pastimes of the 19th century. A photographer's paradise, the Village is complete with lanes and pathways, farm animals, rail and stump fences, vegetable and herb gardens, as well as other authentic details of a 19th century hamlet. See one of only a handful of working Jacquard looms in North America. This rare exhibit offers you the exceptional opportunity to see the workings of the loom closely from above on a mezzanine. The Village is the site of David Fife's 1820's log cabin. Fife was accredited with the discovery of Red Fife wheat in 1842. 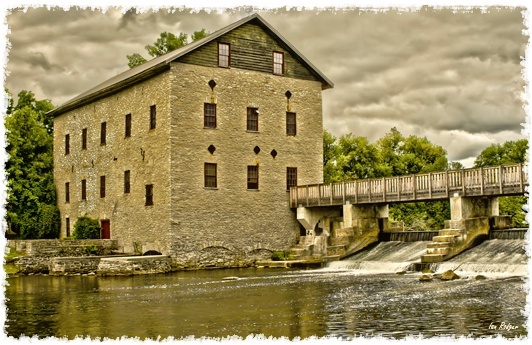 Originally built in 1846, the three-storey Lang Grist Mill still grinds whole wheat flour throughout the summer season. The limestone for the walls of this impressive structure came from the Indian River. Special events are offered throughout the summer and fall. Please visit langpioneervillage.ca for event dates and details. Have something to say about Lang Pioneer Village? Our two Grandchildren (7 & nearly 9) were sort of not another village museum! However when they got through doors they loved it. We have been to several of these sites such as Black creek, Upper Canada this is much smaller than Upper Canada but has a lot packed in. The kids and us enjoyed most the First Nation woman explaining the way of life of her people in times past and the significance of the branch and hide tepee we sat in. Schoolroom was near the top too they did the work on the board on their slates, the teacher rang the bell and sent them out to play they loved that. Perhaps she wanted to get rid of them! Just joking. The mill was fascinating but we were disappointed they had none of their milled flour for sale.Kids thought the mill boring but it was the end of a long hot day. It was a good weather day before school returned and we were surprised how few visitors there were considering what a great place it was to enjoy and learn of the history of this part of Canada. Good value BBQ food perfect except for the wasps.